Woodbridge, Suffolk: Antique Collectors Club, 1993. cloth, hard cover in dust jacket. heavy volume. minor bump detectible to back board corner, low impact. no other flaws. clean, no writing, markings, labels. strong binding. ; english text. ; 483pp., 110 color plates, 265 b/w illustrations, and over 2200 entries. a valuable resource and reference.. First Edition. Hard Cover. Near Fine/Near Fine. 4to - over 9¾" - 12" tall. Keywords: Russian Art. ; Soviet Art. ; Russian Artists. ; Soviet Artists. 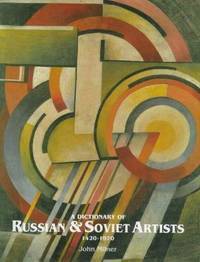 ; Russian Art Dictionary.